Does difficulty affect trophies? : There is no difficulty setting for this game. Additional Peripherals Required: Playlink was added as a free update on September 12th, 2018 and is optional. UNO makes its way onto the PS4 with new features! UNO is an iconic classic card game where you match cards either by matching color or value and play Action Cards to change things up. The goal of UNO is to race against other players to empty your hand before everyone else in either Classic play or customize your experience with a variety of House Rules and match settings to ensure you and your friends never play the same game twice. More importantly is the new trophy list. For those that remember the PS3 version of UNO, it had a nasty trophy for being in the top 50 when you check the Leaderboard. Thankfully, that trophy isn’t on the PS4 version! In fact, the PS4 version is a simple basic trophy list for the game. You should unlock 9 trophies with ease just by playing naturally. There are a few trophies that I recommend you boost because UNO can be luck based sometimes. There are only two trophies for you to really keep an eye on. They’re for winning a game with more than 700 points and winning 20 Wild Draw Four challenges. “Winning 5 games against 3 AI” together. Stack Draw Twos and Wild Draw Fours to pass the penalty to the next player. Play a 7 to swap hands, play a 0 to pass hands around. If you draw a card on your turn and it’s playable, it’s automatically played. Wild Draw Fours may be played without being challenged. When you draw a card on your turn, you must draw until you get a playable card. While you’re boosting, I highly recommend that you and your boosting partner go for the 700 Score trophy together. For more information about that, please refer to the trophy guide. This step might not be needed for some people, but chances are the last trophy you might be missing will be for winning 20 Wild Draw Four challenges. You can do this naturally just by playing the game and calling the challenge out every time it’s played against you. However, you can also boost this trophy as well with the help of at least 1 boosting partner. See the Trophy Guide section for the boosting methods. Unlock all other UNO Trophies! This trophy is like a Platinum Trophy. Earn all other trophies to unlock this trophy. Complete the First UNO round. Chances are that this will most likely be your first trophy that you’ll unlock. Once a player or a team player no longer has cards remaining in their hand, the game round is over, points are scored, and the game begins again. 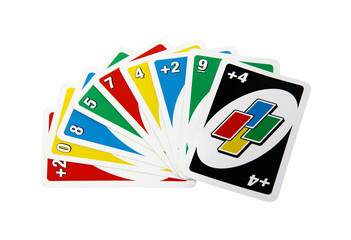 Win the First UNO game. This trophy is for winning an UNO game by reaching the Score Limit. This can either be done in Solo Match or 2v2 Match. The fastest way to get this trophy is by setting the Score Limit to “One Round”. Once you no longer have any cards remaining in your hand, you’ll win the game. This is for successfully calling UNO 10 times, which is done by pressing the button when you get down to your second-to-last card. It’s very important that you press the button before actually playing your second-to-last card from your hand. If you forget to call UNO, another player can challenge you and force you to draw two more cards. This trophy is cumulative throughout any games you play. Successfully make opponent draw cards with Wild Draw Four 10 times. This trophy is for successfully making an opponent draw cards with Wild Draw Four at least 10 times. A Wild Draw Four card is basically the most powerful card in the game as you can choose the color of play and force the next player to draw four cards. This trophy is cumulative throughout any games you play. Please see Nerves of Steel for more information if the other player challenges you. Successfully Challenge a missed UNO 15 times. This trophy is for successfully challenging a missed UNO call at least 15 times. As mentioned in the Be Heard trophy, a player can call UNO when they get down to their second-to-last card. If these players forget to call UNO, you can challenge them by pressing the button and force them to draw two cards. This trophy is cumulative throughout any games you play. Win 5 matches with at least 3 house rules. With the above settings you’ll have a better chance at unlocking the trophy, and you only need to win 5 matches with these settings. Since its set to One Round, the moment you have no cards in your hand is a win. It should be noted that you don’t want to attempt this trophy with Draw-to-Match on because it’s possible for the game to go on forever to the point where nobody will win the game. It’s also recommend that you attempt this trophy along with defeating 3 AI opponents 5 times, so you’ll unlock Just a Machine at the same time. If you struggle with winning this way, you can always get help by boosting the House Rules wins online. Additionally, the Jump-In is also another House Rule, but you need 20 Ubisoft Club Points in order to unlock this House Rule. It’s not needed for UNO’s 100% completion. Play Action Cards 100 times. You choose the color of play and force the next player to draw 4 cards. Wild Four Cards have no color restrictions and can be played anytime. You get to choose the active color of play; Wilds have no color restrictions and can be played anytime. The next player must draw 2 cards and pass (cannot play a card). The next player must skip their turn (cannot play or draw a card). The order of play goes in the opposite direction. Win 5 games against 3 AI. This trophy is for winning 5 games against the 3 AI, meaning that this must be done in Solo Match. In Solo Match you play a Classic Match against computer-controlled opponents. I highly recommend that you combine this trophy with the Our House trophy. That way you can unlock both trophies at the same time. Change the Color with Action Cards 40 times. This trophy is for changing the color with Action Cards 40 times. This only applies to the two “Wild Cards”. Once you’ve played either the Wild or Wild Draw Four 40 times, the trophy will unlock. This trophy is cumulative throughout any games you play. Win 20 Wild Draw Four challenges. You got caught and must draw 4 cards. The player must draw 6 cards instead. Out of the above, you want the first option to happen. This only happens if the player who played the Wild Draw Four card played it illegally. If you caught them, they will be found guilty and forced to draw 4 cards. If you failed the challenge then you’ll be forced to draw 6 cards. Have the player who’s going for the 20 win challenge trophy call it every time they’re challenged. They’ll win every time because the helping boosting partner should be drawing cards or playing a useless card. If you’re the person going for the trophy, then be sure to get rid of any Wild Draw Four Cards that you draw in your hand. This will enable the other players to possible reuse them if drawn. You should manage about 8-12 successful Wild Draw Four challenges per a game. It should be noted that you don’t want to play Reverse cards unless your partner has unlocked the trophy or the AI/Randoms have reversed the game. Note: You cannot challenge another player if the House Rule for “No Bluffing” is on. That House Rule means Wild Draw Four cards can be played without being challenged. This trophy is online and will only unlock by simply winning 10 Online Games. This can be done with Classic Match or 2v2 Match. In order to check how many wins you have left, select “Leaderboards” and then scroll down to “Total Wins”. Once the host makes the lobby, press and invite your boosting partner. You’ll be on the same team this way. You can invite a 3rd or 4th player if you like, but they shouldn’t be winning the game if you do. Once you start the match, have the host keep drawing cards while the partner player goes for the win. You can see each others’ hands and as the game is random you two should know how to win by looking at each others’ hands and cheating while playing online. Win a game with more than 700 points. If an opponent had a hand like this when you win, that is worth 123 score! So basically you count the numbers altogether from 0-9. All Action Cards are worth 20 points each (Skip, Draw Two, and Reverse), but all Wild Cards are worth 50 points each (Wild and Wild Draw Four). If you’re playing 2v2 Match, your partner’s hand doesn’t count towards the points. It must be from the other two player’s hands. Thankfully, you can obtain this trophy very easily with boosting. You might get it naturally if you’ve chosen to boost your Nerves of Steel trophy. Depending on how you choose to boost this trophy, based on how many boosters/partners/friends you have in the session. You can either choose to boost in Classic Match or 2v2 Match, but it should be noted that both boosters on the same team during a 2v2 Match will both unlock the 700 trophy at the same while Classic Match only one person can obtain the 700 point trophy. You only need at least one boosting partner for this game match setup. Have the host invite the boosting partner into the lobby (if you have a 3rd or 4th boosting partner, you can invite them too so they can draw cards). Now the host player is usually the person that will go for the trophy first, while the other boosting partner(s) will simply keep on drawing cards every turn without playing anything. If you stall long enough to empty the deck out, you’ll score a lot of points when you win the game this way. The host should be telling the other boosting partner(s) what cards are in their hand when the time comes for them to win. You do this by using a party chat and typing terms like R,B,Y,G (Red, Blue, Yellow, Green) and what numbers or type of Action Cards you have in your hand. The game is random by nature, but if done correctly you’ll score about 900-1400 points. The host will unlock the trophy once they get rid of the cards in your hand. You only need at least two boosting partners for this game match setup. Have the host invite the boosting partner into the lobby. The host and their partner will be the ones going for the trophy. If you have a 3rd or 4th boosting partner (or if one of you owns another PS4), you can invite them into the lobby as well. The 3rd and 4th boosting partners will not be going for the win, but will keep drawing cards every turn without playing anything. If you stall long enough to empty the deck out, you’ll score a lot of points when you win the game this way. The host and winning partner should be looking at each others’ hands and helping each other out, but it’s best if one of you goes for the win or force the other players to draw more cards etc. The game is random by nature, but if done correctly you’ll score about 900-1400 points. Both the host and their partner will unlock the trophy at the same time because you both share the same score with each other.